Arctic Mountain Front Suspension: Arctic Mountain Suspension (AMS) is all-new for 2016, from its single-post spindles set to a 27-degree caster angle for better sidehilling, to the 2.4-lb. weight savings in the A-arms and 7-in. tapered skis. All that plus a narrower 36-in. stance. FOX FLOAT® 3 shocks cushion aggressive bumps and smooth out even the harshest ruts. FLOAT-ACTION Rear Suspension: Unique tri-hub rear axle system is engineered to be very light and very strong. 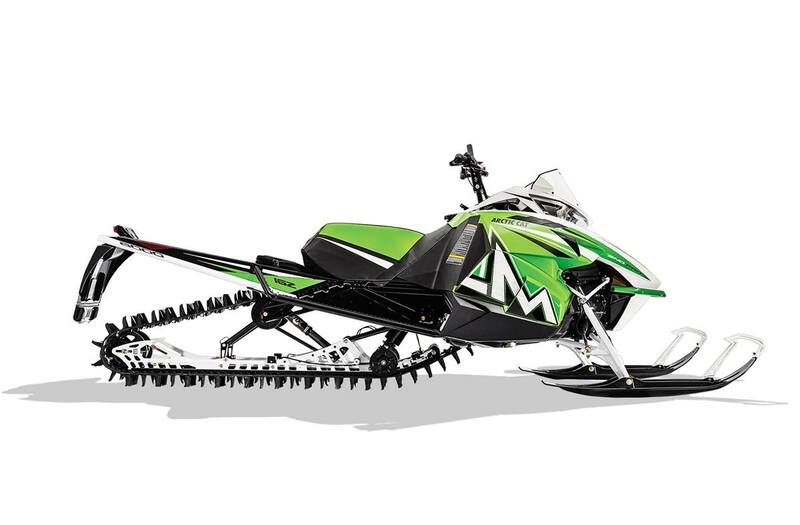 Front-arm Arctic Cat® IFP shocks provide stability, while rear springless FOX FLOAT® 3 air shocks provide a full range of pressure and tuning options while reducing snow buildup weight. 162-in. Power Claw Track with 2.6-in. Lugs: This lightweight, ultra-long 162-in. single-ply track sets the standard for deep snow performance. Stagger-set, curved-forward paddle towers won’t fold over. This track features a powder-devouring 2.6-in. lug height.